In a small two-storey 76sqm loft located 30 minutes from the northern edge of Beijing just outside the fifth ring road, 27-year-old Wang Xiao Kang sits at his work desk looking at blueprints. Towering right over the slightly hunched Wang on a bookshelf as he reads his laptop screen is a two-metre tall homemade replica of the Iron Man Mark I armour, and just behind him in his tiny kitchen/living room stands a clay mannequin wearing the Mark III helmet. Wang's perceived obsession with Iron Man is a little bit more complex; it is a love for cool design and a yearning to create something for himself. Wang, or rather Master Kang, his online handle, has been the talk of the Chinese and Western internets for a while now. He first gained notoriety after a video of his homemade wearable foam Iron Man Mark I armour hit Youtube. We here at Kotaku just recently posted Wang's latest video where he showed off his process for making a mechanized Mark III helmet. 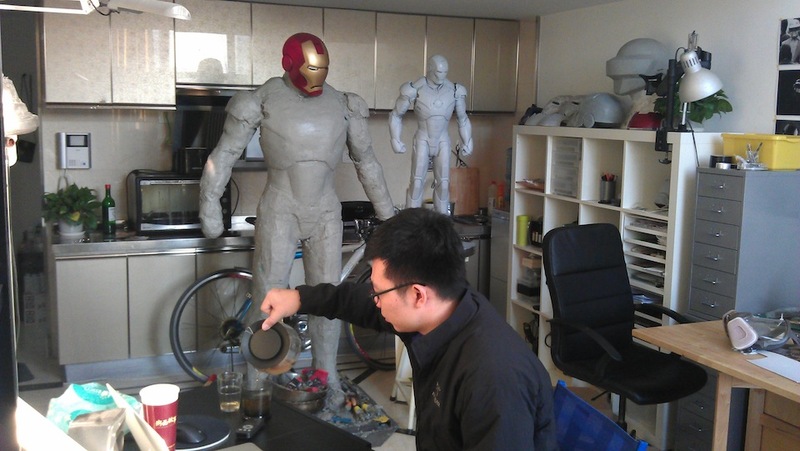 While D.I.Y Iron Man costumes are a dime a dozen online, Wang's contribution stands out as one of the best to come out of China. Originally from Shandong province, Wang moved to Beijing for university. After graduating with a degree in media design, Wang got a job doing web design. The desk job wasn't exactly what Wang wanted to do with his life, but he was happy doing it nonetheless. 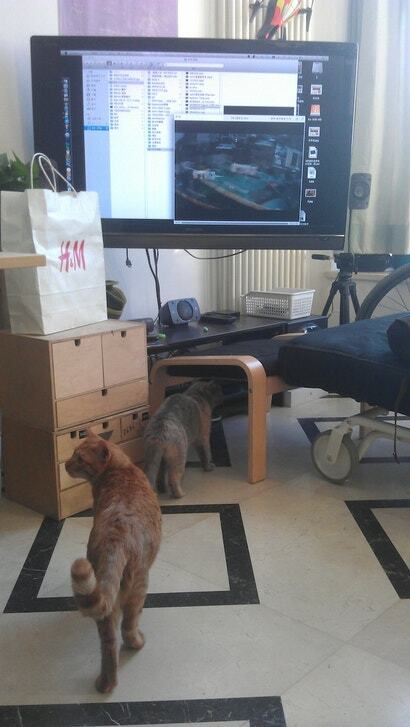 Then 2008 hit and Wang's life was totally changed. "I watched Iron Man in 2008 and I was enamoured with the armour," said Wang. "The armour, it was so cool, and I just thought it'd be fun to try to make my own replica." Setting off to create his own Mark I armour, Wang enlisted the help of a few friends, and in June of 2011 he was able to show off his completed costume. Wang says he watched loads and loads of online videos; everything from D.I.Y videos to the official making of videos. One walk past Wang's bookshelf shows that he's heavily invested in special effects design. "It took a while to get it off the ground because there was a lot that I had to learn about the process," said Wang. "It was a lot of trial and error, and we also had lots of projects working at the at same time." Wang says that when he was a child he used to work and build things and that he developed a passion for creation at a young age. Growing up and working in design he put his passion into his work. At his day previous day job, Wang had helped and designed a series of non-organic "Christmas Trees". 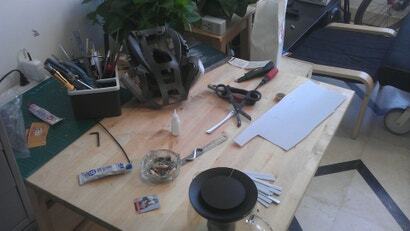 His brother also introduced him to some work as a prop maker. During the release of the 2010 Hong Kong action film Triple Tap, Wang was "tapped" to make the guns for the Beijing premier. Because guns are illegal in the Chinese mainland, and it was illegal to transport even model and sports guns from Hong Kong, the producers of the film came to Wang's brother to find a prop maker in Beijing. Wang created "guns" that Daniel Wu and Louis Koo would show off during the mainland premier. Ultimately Wang wants to create his own props and collectibles, which he hopes to one day sell. Working with various artists, Wang's come up with a few crazy designs. 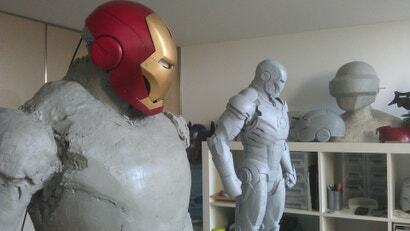 For now Wang is working on finishing his Mark III armour. With the helmet done, Wang's started working on the suit. Standing in his kitchen at about 6 foot 5, his Iron Man costume right now is just a plastic mannequin with shoulder pads moulded out. He says by the time the Mark III armour is done, it will have all the lights and whistles like the movie (sans the firepower of course). Wang expects the armour to be complete by mid 2013. 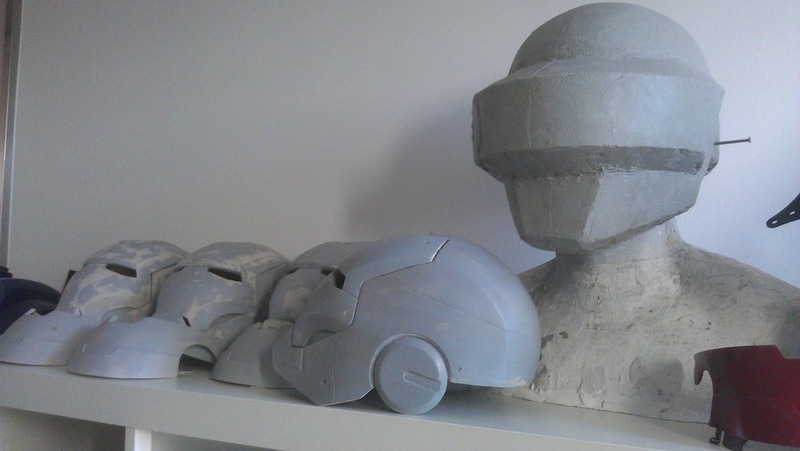 Wang's currently also working on replicating the helmets of Daft Punk, and playing through Halo 4. 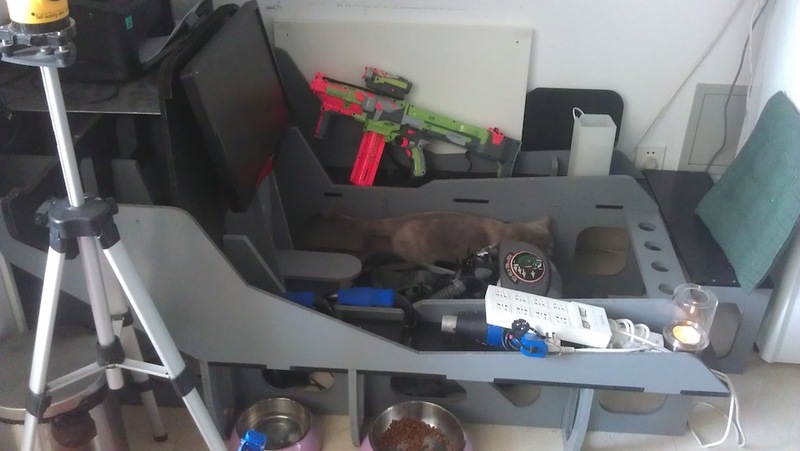 He's interested in the Spartan helmet design. One thing that Wang definitely wants to get across to the world is that while he may be the one making the replicas, he's doesn't deserve all of the credit. Wang works with his friends, various members of the Chinese online DIY community, and an assistant. "We all help each other out when we can, when I make these videos some of the software guys see what I'm doing and they reach out saying they can help and I'm more than willing to take them on," said Wang. "I know how to make the props, they know how to program them, so everything works out for the best." Very cool work, and i know its immature but i fully could not stop laughing throughout the whole article. He'd be a hit with the girls. 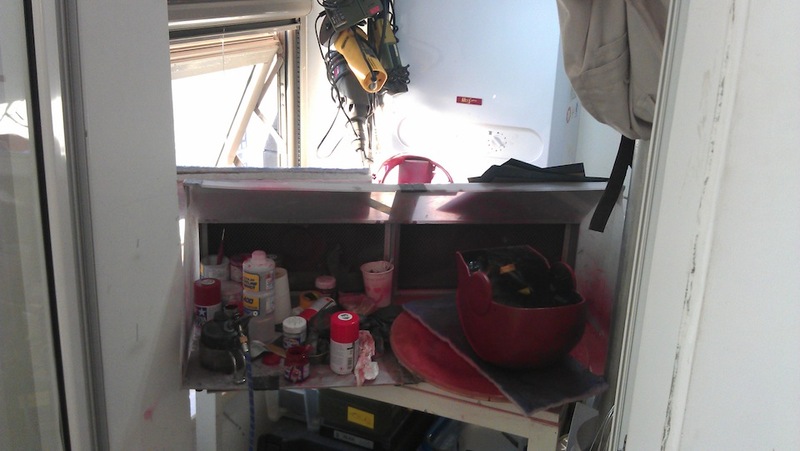 I like the tiny confines that include paint cans, a room full of flammable items and a smouldering ashtray. My guess is we'll see him hanging from his window sill with his apartment on fire on Liveleaks.